Posted August 18, 2017 by Bob and Jane Kinzie & filed under Backup Generators. Your backup generator is probably something you tend to forget about until you really need it. If it’s not properly maintained though, it could let you down when you need it most. Don’t get caught in the dark! 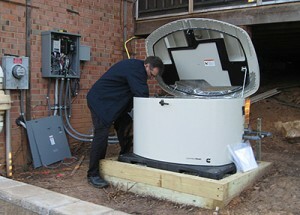 Today we’ll look at a few important benefits of investing in regular generator maintenance. Although you will have to pay a modest fee to maintain and service your generator, adhering to a regular maintenance routine can actually save you money in the long run. Businesses can lose tons of money if they’re forced to close their doors during long power outages, for example. Homeowners, meanwhile, can face their own set of costly issues when the power goes out. Sump pumps stop draining water from basements, heaters stop warming cold pipes and refrigerators stop preserving perishable food items. A well-maintained generator can last for tens of thousands of hours. If properly taken care of, your generator could continue to serve you through years of power outages. Regular maintenance can prevent and correct a variety of issues such as algae buildup in the fuel system, clogged fuel injectors and dead batteries. If left unchecked, some of these issues could permanently damage your generator, forcing you to invest in expensive repairs or purchase a new one. With proper maintenance, you can avoid all these problems and more. Power outages can be downright dangerous during extreme weather events, particularly if you have family members with health concerns. Having a well-maintained generator on hand in case of weather emergencies can ensure that everyone stays safe during prolonged power outages. Finally, remember to pay close attention to your generator’s weekly test schedule. Once a week, your generator’s motor should kick on for 10-15 minutes to perform a self-diagnostic test. If it misses this test, it means that something is wrong and you should notify your maintenance team immediately. If it’s been a while since your generator was last serviced, Kinzie Backup Generator Systems can work with you to develop an effective maintenance plan for the future. Give us a call or contact us online to learn more.